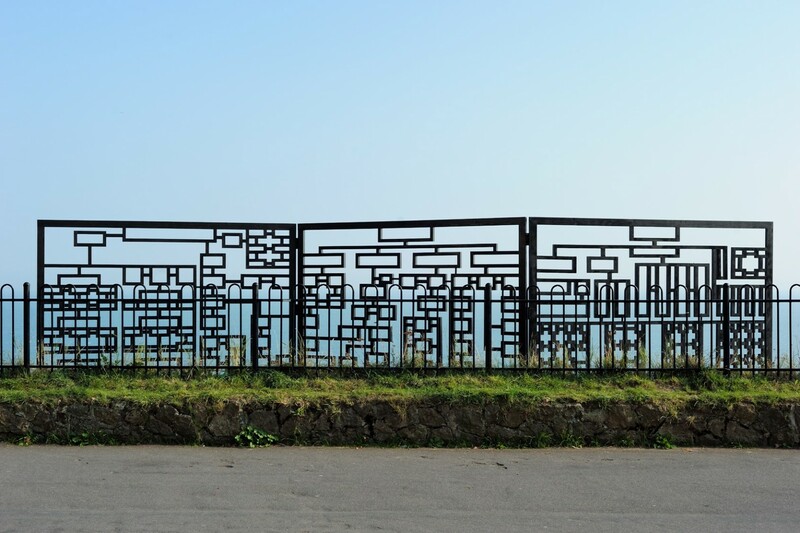 When invited to contribute to the 2014 Triennial, Kwan’s researches led him to The Vinery, a formerly glass-roofed sitting area perched on the cliff edge on The Leas with fantastic views over the English Channel. Kwan identified the faint traces of ‘chinoiserie’ present in the architecture of the building. ‘Chinoiserie’ describes a fashion in interior design in the English culture of leisure since the mid-seventeenth century, a popular Western aesthetic characterised by the use of Chinese motifs and techniques. 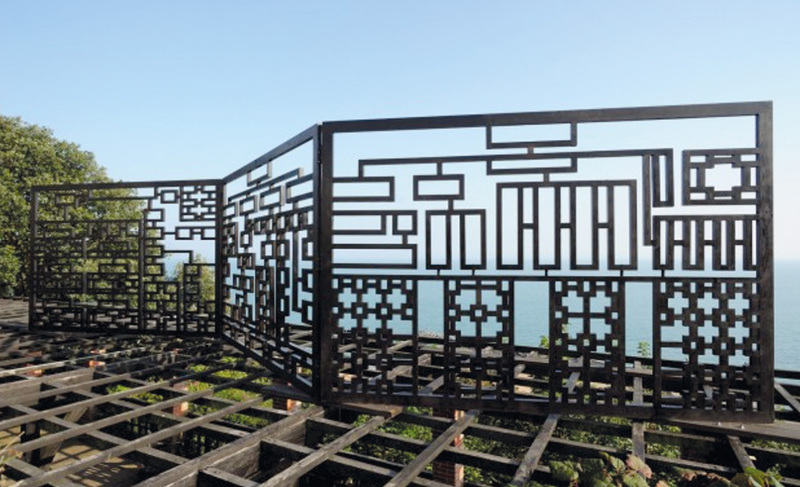 Kwan’s sculpture now stands on the roof of The Vinery, in the form of a three-part folding screen, referencing the traces of chinoiserie in the structure below. The screens frame views of the English Channel, the still heavily trafficked route linking Britain and China, and also highlight the current positioning of China in national and international consciousness about the future. The design of the screens is based on organisational diagrams of three ‘China Watchers’. ‘China Watchers’ are organisations that are keenly aware that the coming century ‘belongs’ to China, and make it their business to research and inform themselves thoroughly about current affairs in China – whether from the point of view of finance (HSBC), of security (MI6), or of knowledge creation and exchange (Oxford University). Will Kwan’s work is grounded in social and political awareness, with a keen eye for cultural difference and the power structures encoded in cultural manifestations (for instance the passing of the title of ‘workshop of the world’ from 18th C Britain to 21st C China). Kwan makes art that takes a critical view on the visual and material culture of globalisation and examines the socio-political and cultural consequences of how the ‘global’ is represented. He has worked with video, photography, performance and installation while continuing to regard his work as fundamentally sculptural.